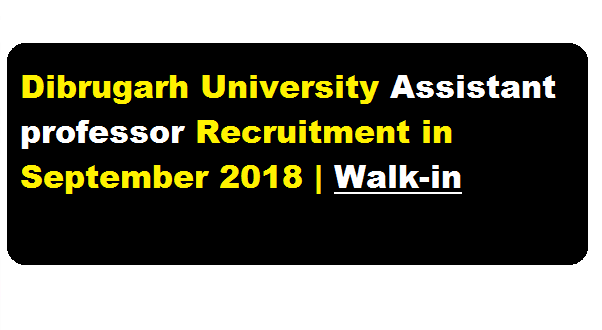 Dibrugarh University Recruitment 2018 September | Assistant Professor in Mathematics :- Dibrugarh University has published a job notification in their recruitment section in September 2018. According to the Latest Dibrugarh University Recruitment notification, A Walk-in-Interview will be held on 24/09/2018 at 10.30 A.M. in the Bhojraj Seth Conference Hall of the Vice-Chancellor’s Office. D.U. for 01(one) temporary post of Assistant Professor in Mathematics on contract basis in the Dibrugarh University Institute of Engineering and Technology. Full details of this Dibrugarh university recruitment can be found below. In this section, we will discuss in details about the recruitment of Assistant Professor Post under Dibrugarh University Job Recruitment 2018 (Sept) with vacancy details, eligibility criteria, salary with other details and requirement. Educational Qualification: Candidates must have done M.Sc. in Mathematics(minimum 55% marks) with NET/SET/SLET in Mathematics or Ph D as per latest UGC norms. Interested candidates having the requisite qualification may appear in the interview with copies of bio-data, attested copies of all testimonials and experience certificate, (if any) along with the original certificates of qualifications for verification. They will have to register their names as candidates by paying Rs. 200/- (Rupees • two hundred) only before interview. No. T.A. and D.A. will be admissible for the purpose. Venue : Bhojraj Seth Conference Hall of the Vice-Chancellor’s Office. D.U.